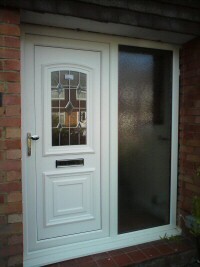 The REHAU-Tritec 60mm system provides a versatile door range suitable for both New Build and replacement installations. Engineered to provide an accreditation achieving system at a cost competitive price, REHAU-Tritec is the ideal door system for the modern market place. All profiles can be supplied with gaskets in place/integrated into the profile, thus eliminating labour intensive activities. Choice of finishes available; REHAU White, Mahogany, Rosewood and Golden Oak wood effect laminated foil. All finishes have colour matched gaskets Alternative laminate foil finishes are available by special order. REHAU Acryl II Colour coating system available in 150 RAL colours. Style - The beautiful moulded and richly grained exterior surface has the look and feel of traditional timber without its environmental and maintenance disadvantages. Available in a range of colours and wood grains with white and wood grain frames, the composite range comes with a stunning selection of hand crafted glass patterns to perfectly suit your own style and individual taste. 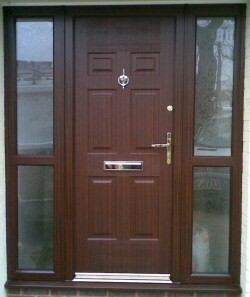 Insulation - The composite door has a higher thermal and sound insulation compared to most doors. Security - The combination of its YALE - secure by design, multipoint locking system, centre deadbolt and a full 72mm PVCu reinforced outer frame makes the composite capable of foiling even the most determined intruder. Durability - The vacuum formed outer skin, combined with fully sealed edges create a door that’s guaranteed not to warp, twist or flake. 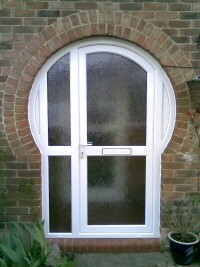 The composite door will never need to be painted. Available in either PVCu or aluminium, bi-fold doors offer great appearance and advanced performance meaning inevitable demand for a modern and sophisticated door system full of benefits. Our Bi-fold doors boast superior engineering and design to complement their outstanding versatility. Panels can be connected in a number of configurations so that the doors can be bi-fold or Multi-fold allowing greater flexibility. This is ideal for connecting any rooms in the house, or the house to the garden outside, where they provide additional natural light to the room. The door operates smoothly and is remarkable easy to open.